It’s never too early to start thinking about your spring garden. We have over 170 plants & herbs that will be ready for spring shipping & planting this year. 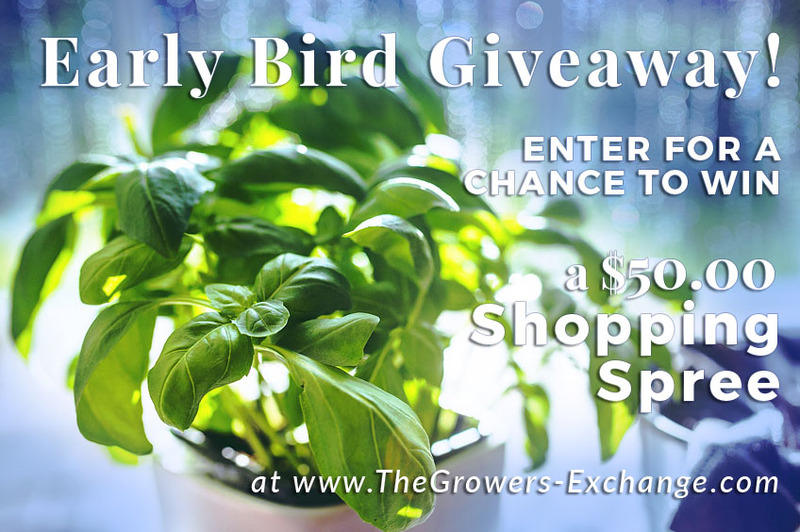 In celebration of this coming spring gardening season, we’re giving away a $50 shopping spree on our website, The Growers Exchange. Enter using the app below for a chance to win. The winner will be picked on Groundhog Day, February 2, 2017. Looking forward to my spring garden! I have a few veggies start in the greenhouse and we are trying to complete our front yard terraced herb, veggi and edible flower garden. Its not nearly going to be as big as my explanation. It has taken a lot of planning to utilize the small amount of space we have. There are free roaming pet rabbits and chickens in the backyard make growing anything difficult. looking to spring for a new fresh garden, my cats are looking forward to their catnip plants. Waiting out ice storm by planning garden! My daughter is the one with the green thumb and last few years I have sent her herbs from your company. She really likes the quality of the plants and when one was not up to par you gave a rebate towards another plant. She uses the herbs for cooking and oh what a mojito! Poured over your catalog last night. Lots of pages with the corners bent over. Looking forward to adding to my herb garden with plants from you. Ready to start my herb garden! Help! Make a green thumb! My mother is 91. Every year since I was little we attempted to try some new plant or variety of seed. Some years they work out some they don’t. Tis contest could give her an opportunity to try more than one new thing a year. Always look forward to spring and your spring mailing. Great fun to plan my garden with you.. Vowed to make a fresh start on healthy eating! Sooooooo looking forward to all the fresh homegrown produce I hope to be planting and eating this year! Can’t wait to get my hands in some dirt! New beds are all ready for a new season of growing from the growers exchange. I’ve had it with winter. Can’t wait till spring. Can’t wait for Spring and fresh herbs! I’m new to the site and I can’t wait to get involved in my much loved free standing herb trug! I’ve been growing herbs for years. Now I want to do a little experimenting! Love fresh herbs and try to plant more every year. Hope to win so I can add more variety to my garden. I look forward to working in my gardens! Come on Spring! This year I’m planning on bringing my soul to our county extension office so I’m aware of what needs to be added to my soul for healthy tasty herbs n produce. Really enjoy your tips on soil preparation. Encourages confidence to have Growers Exchange in my corner😊. Can’t wait to get started. Started cooking more and not that fond of paying high prices for spices and seasonings so plan to grow everything I can. Really excited for this new year! I’ll be starting the “Giardino del Nono” who taught me the love of plants.